Providing design, permitting and construction phase services for new facilities to properly handle stormwater flows from the 200-acre Monmouth Park Racetrack in Oceanport, NJ, owned by the New Jersey Sports and Exhibition Authority (NJSEA). New Jersey Department of Environmental Protection (NJDEP) mandated compliance with New Jersey Pollutant Discharge Elimination System (NJPDES) Concentrated Animal Feeding Operation (CAFO) regulations. 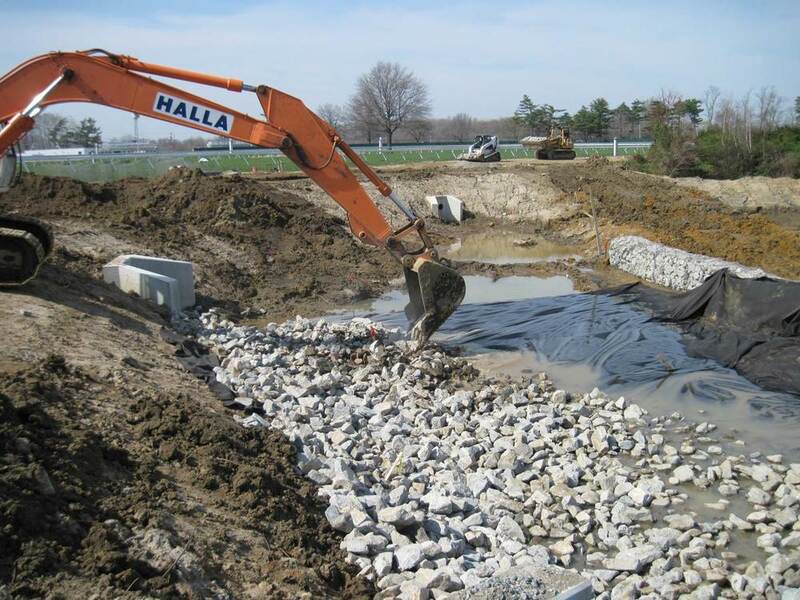 These regulations required on-site handling and treatment of horse stable area stormwater runoff for up to a 25-year storm, significantly reducing contaminants to Branchport Creek, popular for boating and fishing. In the mid-1990’s NJSEA constructed facilities to collect horse washwater and “first flush” stormwater runoff for conveyance to the Two Rivers Water Reclamation Authority (TRWRA) wastewater treatment facility. At that time, TRWRA could only accept up to 125,000gpd. Runoff volumes often exceeded that amount, with the excess discharging to local streams. The challenge was collecting all the contaminated runoff, yet limiting the discharge to TRWRA while eliminating overflow discharges to local streams. The PS&S design included significant grading to contain stormwater runoff, new separate roof drainage and CAFO stormwater runoff collection piping, improvements to the infield pond, a 110 MGD stormwater pump station to convey peak flows, and a 6-million-gallon vegetated basin designed to detain flows from a 25-year storm. Up to 500,000gpd of water can now be detained and later conveyed to TRWRA for treatment. The design included approximately 1,900 linear feet of 72-inch interceptor for interconnection of the stormwater collection piping to the pond and pump station. The project was approved by NJDEP and funded by the NJ Environmental Infrastructure Trust.